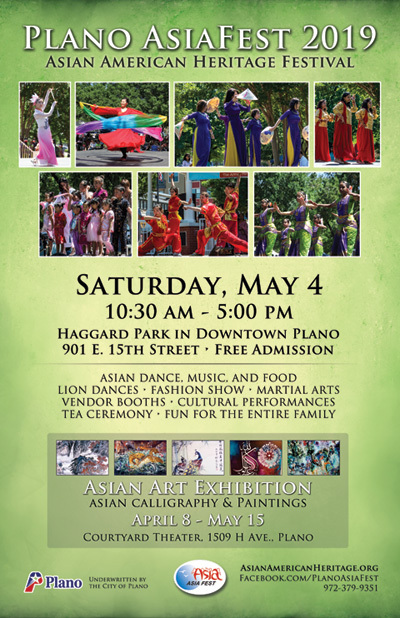 Join us for the 16th year of Plano AsiaFest held in downtown Plano's Haggard Park! PowerPoint of Displayed Artwork from 2019 Art Exhibit (45 MB file), click here. Photos from the 2019 Artist Reception are on Facebook, click here. To see photos from last year's event, click here and scroll down to Photo Galleries. Like us on Facebook (facebook.com/PlanoAsiaFest) to receive up-to-date notifications. If you're interested in being a sponsor for AsiaFest '19, please view our sponsorship details and contact us. 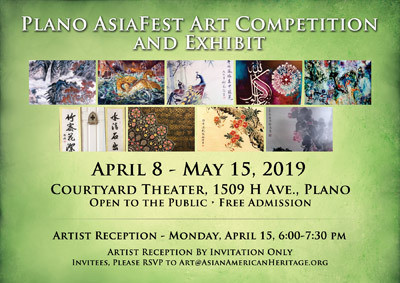 Please consider providing a donation to support Plano AsiaFest.